Iron Man 2 comes to us courtesy of studio Griptonite games, a developer I’ve taking a liking to for crafting some great superhero themed games like Spider-Man: Web of Shadows and Shattered dimensions (also for the NDS) and Marvel Super Hero Squad: the Infinity Gauntlet. To simply sum up the story, it’s the same as every single other version of Iron Man 2 that I’ve reviewed. It’s presented with text boxes and still character portraits that while not voiced like the Wii/PSP version are much easier to swallow given the limitations of the hardware. 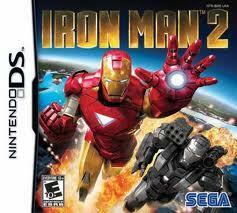 Unlike the first Iron Man NDS game which was an overhead twin stick style shooter, Iron Man 2 is a traditional side-scrolling action game. Like all the other versions of Iron Man 2, both Iron Man and War Machine are playable but this version is probably the one that goes the extra step to make each character truly different. Iron Man is a far more maneuverable and nimble character, and while in flight mode can boost around the map whereas War Machine cannot boost but still has the capability of flight. Given the fighting style of the two Iron Men, it’s very fitting for the characters in the film and comics. The differences don’t stop there though, Iron Man is traditional controlled by the directional pad and face buttons and War Machine is uniquely controlled using both the d-pad and touch screen. You move War Machine with the d-pad and the only other button you will use is the L-button to lock on target enemies for firing missiles. For combat you use the touch screen to aim War Machine’s chain gun with 360 degrees of movement and tap at enemies to launch bombs and perform melee if they are close. In this game War Machine actually steals the show from Iron Man and it’s in fact easier to take out enemies and bosses with that character. While the game goes out of its way to make both Iron Man and War Machine control really well, the levels and enemies are rather boring. 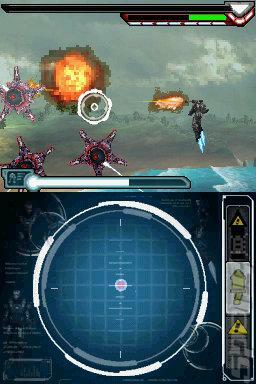 Each level involves you doing nothing more than moving around and taking out the same robot enemy types over and over, outside of a few stages where your in a fixed almost R-Type or Gradius style perspective where the game turns into a 2-D space shooter of sorts. The game also artificially extends its length by having you complete every single level as both Iron Man and War Machine to progress. In each level you come to a juncture where your prompted to go one way or another, but as opposed to you just completing both objectives in one go starting from the choice point, you have to start the entire level over and do everything again. What’s worse is that you never have to see the second choice if you don’t want to, you can pick the same path for both characters and still get credit for level completion. Even though the levels don’t really stand out, the game does a really good job of translating the feel of playing as the Iron Man and War Machine characters to the NDS that you don’t mind. Iron Man 2 for the NDS is not as recommendable as Iron Man 1, but it’s still worth a look at easily the best version of Iron Man 2.